In Episode 82 of MayaCast, Tom and Kip push through the backlog of listener emails and voicemails. There are two MayaCast Libations segments, a MayaCast MasterClass segment, and questions about lists, rules, factions, and etiquette. But first there is news and information from Carlos to cover, and the Rule of the Week! Add all ingredients to a blender and frapp that! Shake with crushed ice; strain into a rocks glass over new ice cubes. Those at the tip of the spearhead demands action and energy; the warmaster will accept nothing less. Bite into the espresso bean and down the shot, and you immediately feel Extremely Impetuous. It is as black as an Eclipse Smoke Template and just as useful for staying vivacious during a long game. The perfect thing to toast a well-executed First Blood, this is the drink of choice for any self-respecting Rambo miniature. Most folks ‘doctor’ their hair-of-the-dog concoctions with Worcestershire sauce, but Senor Massacre laughs at such weakness: he probably uses ghost pepper hot sauce in his! You don’t need Bioimmunity to down this drink, but it helps! This drink should never be consumed alone, but rather experienced with your opponent to build sympathy for each other’s experience. As a bonus, this likely provides 100% of the vitamins and minerals that typical convention food does not! Any drink named after beautiful sword fighters needs to be as desirable as it is lethal. The true danger for these lies in how easily they seem to be taken at first. In time you will realize you have been sliced by a Monofilament blade and your head is lying at your feet. All of your martial arts will not save you against perfection. 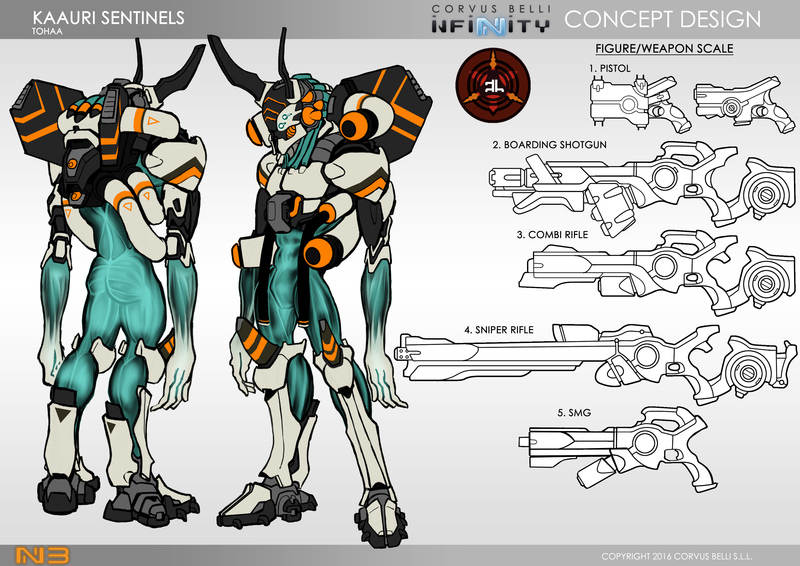 Check out this amazing Dossier we have received for the brand new Tohaa troop profile – the Kaauri Sentinel! These little (S1) guys are very cool looking – and that Tohaa SMG design is Legit! Perhaps the greatest menace to the Tohaa Trident in its protracted war has been the fear and paranoia instilled by the Shasvastii operatives. These underhanded aliens can, through the judicious use of stealth and impersonation, sap the morale of entire units with a single strike, a single assassination. To counteract this insidious threat, the Trident entrusted its Sudiel Section with designing a stopgap solution: an artificial sentry whose watchful eyes would spot any and all intruders. The engineers of the 77 worked tirelessly to improve upon a parasitic life form called Kaaras, a viciously territorial creature that, by tapping into its host’s central nervous system, heightens its senses to detect imminent threats. Specialists from the Sudiel Section subjected this semi-sentient parasite to a process of neural reprogramming, guiding its development into a sort of accelerated, truncated version of Exaltation. Through this process, the species’ intelligence thresholds and submissive tendencies were enhanced, molding it into an obedient but fierce guardian. Once reprogrammed, Kaaras are mounted on mid-range biosynthetic bodies bristling with sensors. When the Kaaras attaches itself to the host’s nervous network, the resulting creature is known as a Kaauri Sentinel. Although their intelligence falls short of true sentience, Kaauri are loyal and deeply devoted to their protective mission. They will readily die to defend their Tohaa masters, and in truth they cannot even contemplate the alternative. It is simply written into their brains. In Episode 81 of MayaCast, Tom and Kip discuss the profiles from HSN3 for Nomads, Combined Army, Aleph, Tohaa, and Mercs. They talk about what changes were made, what’s new, and what roles these new troops can play. We announce the lucky winner of our Scenery Photo Contest as well as the Patreon Raffle Winners from April.